MIAMI, Fla. (October 1, 2018) Brightline, Florida's new hospitality-focused express, intercity passenger rail service, will host its second Tasting Train on Friday, October 5, featuring the Antinori Family Winery, one of the world's oldest family owned companies. 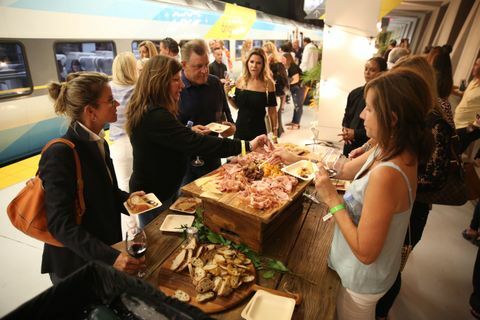 The Tasting Train is an exclusive monthly experience hosted by Brightline that features the opportunity to enjoy premier food and beverage while traveling by train and in Brightline's downtown MiamiCentral station. Guests traveling from West Palm Beach or Fort Lauderdale can enjoy Antorni's Guado al Tasso wine samplings in their ride experience to MiamiCentral. When riders disembark, they will be greeted by a stylish reception featuring live music, multiple tasting stations serving Antinori's finest wines from Tuscany and carefully selected cuisine options, all set against incredible views of Biscayne Bay and the downtown Miami skyline. The reception will take place from 6:45 to 9:45 p.m.
Tickets are start at $100 for the reception in Miami, $150 for the reception and roundtrip train ride with wine tasting in Smart service, which includes an exclusive tasting of rare vintage wines. Train service in Select is sold out. Guests who will travel in Select service will enjoy expanded wine offerings, including the 2015 Tignanello, known as the original Super Tuscan that is from the Antinori family's 140-acre Tignanello Estate in the heart of Chianti Classico, and the 2014 Solaia, which is produced from a signle vineyard from within the Tignanello Estate. Smart Service tickets and tickets to the event in MiamiCentral are available for purchase via Eventbrite. Tasting Train guests must be 21 or older and prepared to provide ID. The next Tasting Train is slated for December 2018. The inaugural Tasting Train in early September brought guests from all over South Florida together for an evening of elegance and indulgence, complete with wine tastings from Far Niente Winery and live entertainment between West Palm Beach and Fort Lauderdale to Miami.